Job Readiness - Moral Reconation Therapy - MRT® distributed exclusively by Correctional Counseling, Inc.Moral Reconation Therapy – MRT® distributed exclusively by Correctional Counseling, Inc. Job Readiness - Moral Reconation Therapy - MRT® distributed exclusively by Correctional Counseling, Inc. 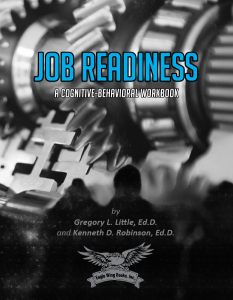 The Job Readiness workbook is used in many settings, including behavioral health agencies, substance use disorder programs, residential programs, vocational programs, welfare-to-work initiatives, and criminal justice settings, among a variety of other settings. Job Readiness has six sections that are completed in six group meetings. The program can be conducted in either an open-ended, ongoing group (in which new members enter when assigned), or as an educational program in which all members proceed at the same pace. The workbook explains what a “good employee” is and helps with self-assessment, setting work goals, and developing good work habits. The workbook also covers how to get and keep a job, and how and why people get promoted to enable ongoing success. Participants gain confidence and strategies for approaching employers for meaningful work, as well as an understanding of how to keep a job. 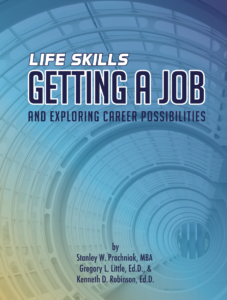 Getting a Job: And Exploring Career Possibilities is a 60-page workbook containing 11 chapters. The primary focus of the program is to teach the necessary life skills to help clients get—and keep—a job and to begin thinking about a career. This workbook should be employed with juveniles who are about to enter the workforce—or with those who have already been employed and are looking for their next job—or a career. 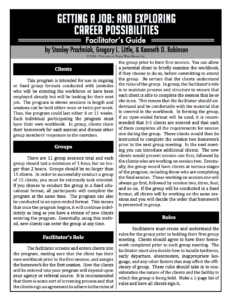 A facilitator guide is also available for this program. Training is not required to purchase and use this workbook.